Americans batted .500 in North American singles finals today, with former French Open Junior champions Whitney Osuigwe and Tommy Paul coming out on top, while Strong Kirchheimer and Charlotte Chavatipon fell short in their quests for their first titles at $15,000 events. The 16-year-old Osuigwe, who received entry into the $80,000 USTA Women's Pro Circuit event in Tyler Texas this week via an ITF junior exemption, continued her stellar play, beating unseeded Beatriz Haddad Maia of Brazil 6-3, 6-4 in the championship match. Osuigwe, the ITF's 2017 World Junior Champion and USTA's 18s National Champion, who won the French Open girls title last year, had reached only one Pro Circuit singles final before today, at a $25,000 event in Florida in January, but she showed maturity beyond her years in her victory today. In the opening set, Osuigwe needed five set points to close out the 22-year-old left-hander, but held on to finally secure the set. It seemed as if Haddad Maia was finding her range in the late stages of the first and early in the second set, but Osuigwe managed to break in the third game of the second set, a lead she hung on to until Haddad Maia broke to level the set at 4-all. Haddad Maia went down 0-40 in the next game, but for the second time in the set she brought it back to deuce. At 1-3, she managed to hold from that position, but this time she could not convert her game point after winning four consecutive points and Osuigwe broke on her fourth opportunity when Haddad Maia sent a forehand long. Serving to win your first Pro title isn't an easy position to be in, and Osuigwe missed a couple of forehands to go down 15-30, but Haddad Maia wasn't able to capitalize on Osuigwe's errors, missing a forehand and a backhand long to give Osuigwe a match point. After a short rally, Haddad Maia netted a backhand to give Osuigwe the title, her first in singles after having won two Pro Circuit doubles titles earlier this year. Osuigwe and Macon champion Varvara Lepchenko are now tied in the USTA's Australian Open Wild Card Challenge with two weeks to go. Even if she does not win the wild card, Osuigwe, who moves to around 226 in the WTA rankings with this title, should have no trouble getting into the women's qualifying at the Australian Open. 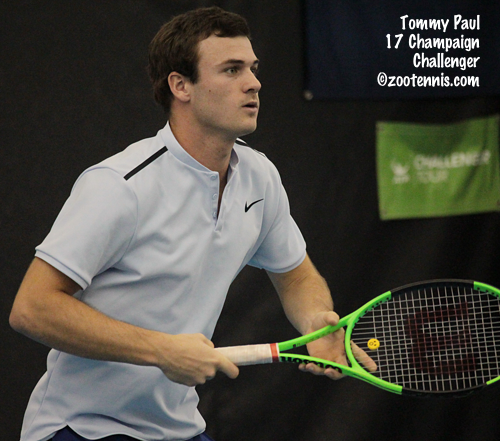 Tommy Paul won the $75,000 ATP Challenger in Charlottesville Virginia, beating No. 8 seed Peter Polansky of Canada 6-2, 6-2 in the final. It was the first career Challenger title for the 21-year-old Paul, who reached the main draw as a lucky loser after falling 6-4 in the third to Wake Forest senior and NCAA champion Petros Chrysochos of Cyprus in the final round of qualifying. Paul, who has won six Futures titles, didn't drop a set in the main draw this week, and although short of his career high ATP ranking of 149, he is now around 222 and should be in the Australian Open men's qualifying, even if he does not win the USTA's Wild Card Challenge. In the doubles final in Charlottesville, unseeded Harri Heliovaara of Finland and Henri Laaksonen of Switzerland beat No. 4 seeds Toshihide Matsui(BYU-Hawaii) of Japan and Frederik Nielsen of Denmark 6-3, 6-4. At the $60,000 ITF Women's Circuit tournament in Toronto, Maria Sanchez(USC) won her fourth doubles title of the year, partnering with Sharon Fichman of Canada. The unseeded Sanchez and Fichman, who lost last week in the final of the $60,000 tournament in Saguenay Canada, beat unseeded Maja Chwalinska of Poland and Elitsa Kostova of Bulgaria 6-0, 6-4 in the championship match. Sanchez, 28, now has 24 Pro Circuit doubles titles on her resume. Unseeded Quirine Lemoine of the Netherlands won the singles title in Toronto, beating top seed Kateryna Kozlova of Ukraine 6-2, 6-3 in the final. Hong Kong's Eudice Chong, the four-time NCAA Division III singles champion at Wesleyan, won the doubles title at the $60,000 ITF Women's Circuit tournament in China, partnering with Qiu Yu Ye of China. The unseeded pair beat China's Jia-Qi Kang and Korea's So-Ra Lee, also unseeded, 7-5, 6-3 in the championship match. It's 2018 graduate Chong's first title above the $15,000 level on the Pro Circuit. At the ATP Masters in Paris, Rajeev Ram(Illinois) won the doubles title, his third of the year, this time with Marcel Granollers of Spain. Ram and Granollers defeated Jean-Julien Rojer(UCLA) of the Netherlands and Horia Tecau of Romania 6-4, 6-4 in the championship match. In Birmingham, at the $15,000 Futures there, No. 2 seed Strong Kirchheimer(Northwestern) fell short in his bid for a first pro title, falling to No. 6 seed Ricardo Rodriguez-Pace of Venezuela 7-6(6), 6-4. And at the $15,000 ITF Women's Circuit tournament in Mexico City, University of Kansas senior Anastasia Rychagova of Russia, a qualifier, won her first Pro Circuit title, beating 16-year-old Charlotte Chavatipon 6-3, 7-5. The ATP's Next Gen tournament begins on Tuesday in Milan Italy, with Americans Frances Tiafoe and Taylor Fritz in the 8-player field. Tiafoe is in the round robin group with Stefanos Tsitsipas of Greece, Hubert Hurkacz of Poland and Jaume Munar of Spain. Fritz's round robin group includes Alex de Minaur of Australia, Andrey Rublev of Russia and Liam Caruana of Italy. Caruana, who played briefly for the University of Texas, won an Italians-only wild card tournament over the weekend to earn his place in the draw.